vDice is the leading blockchain-based betting game for the Ethereum network. It went live on June 13th, 2016. It has processed almost 10,000 bets to-date. It is a classic ‘SatoshiDICE-style’ betting game, implemented as an Ethereum Smart Contract (Dapp), and exists on the Ethereum blockchain. Ethereum builds and improves on the Bitcoin blockchain. In the same way, vDice builds and improves on blockchain betting technology, generally. Whereas SatoshiDICE was somewhat decentralized, vDice is fully decentralized. vDice leverages the power of Ethereum smart contracts to build a game that has no server architecture. Instead, bets are processed through an Oracle, using the 3rd party services of random.org for the random number source. To play, a user sends a Tx to a contract. Then the contract executes the oracle contract. The oracle then calls the contract back. So there are two transactions to a contract for every bet made: one is the user, the second is the oracle. There is also the option for users to contribute Ether (ETH) to each betting contract. In this way users can share in the success of a specific contract and increase the house. The Smart Contracts are live, network tested, and processing bets on a continuous basis. The object of this Crowdsale is the native token of the vDice game called; ‘vSlice’. This token is tied directly the the profits of the vDice game. Holders of vSlice tokens receive a share of vDice profit, proportional to the amount of tokens held, in a fair and transparent way. ‘vSlice’ tokens behave as any standard ERC20 token. People participate in the Crowdsale using BTC or ETH. It will all be resolved to Ether (ETH) and the Ethereum blockchain. The issuance will last 4 weeks, starting November 15th, 2016 and ending December 15th, 2016. The ‘vSlice’ token Smart Contract will be deployed and people who contribute will receive 1:100 for each Ether (ETH) they send, for the 1-month of the issuance. So, for example 100 ETH will get 10,000 vSlice tokens. There will be an an “early-bird” special. The Smart Contract exists with an initial token supply of 60M tokens. That is, 60M tokens will be available and distributed before the dates, through Crowdsale partners, open to any and all who wish to participate through those partners. The Crowdsale Smart Contract is fully decentralized. That is, the sending of Ether (ETH) to the Token Smart Contract will result in the immediate, and decentralized, issuance of the contributors vSlice tokens on the Ethereum blockchain. As soon as they are issued, accrued profits from the game are available. Legal and Compliance: 23% allocation. Expenses, Salaries and Rewards: 23% allocation. Paying expenses and rewards for initiation of the Crowdsale: 15% allocation. Development of new games and projects, according to core competencies: 39% allocation. Participants should visit crowdsale.vdice.io during the crowdsale period; November 15th, 2016 until December 15th, 2016. You can participate using Bitcoin (BTC) or Ether (ETH). Anyone who wants to participate in the crowdsale should have Ether (ETH) held in any wallet: Ethereum Wallet, Mist, Parity UI, MyEtherWallet, Jaxx, Metamask, etc. Once they have an Ethereum account with Ether (ETH), they simply need to send a transaction with a special gas amount (it will be approx. 30,000-40,000 Gas) to the ‘vSlice’ address, as displayed on the website. The transaction will immediately create an equivalent amount of ‘vSlice’ tokens, with an exchange rate of 1:100, in the token contract, without any other user interaction. Once the transaction has been confirmed you will see your token amount on the Ethereum Blockchain, and viewable through web-UI on the Crowdsale website. Participants of this Crowdsale may sell ‘vSlice’ tokens as soon as they receive them, or hold ‘vSlice’ for a longer term. The ‘vSlice’ belong to the owners. They plan on adding 0 confirmation betting soon. Also, Chinese language and an affiliate program. The current success of vDice is strong. Come join the fun. They also have a token sale planned soon. Where you can own part of the game! Yes. vDice is provably fair game. Unlike other gambling site which do say that we are provably fair but one cannot check it, because that is not public, they can do anything at the backend. But vDice implemented as an Ethereum Smart Contract and processed on the Ethereum Blockchain. So, the Smart Contract is public. Anyone can check the code. And anyone can see the bets on the Ethereum Blockchain. vDice has very simple, quick and user friendly design unlike the other site which are providing too many games which make the site slow and less user-friendly. It will take no time to enter in the site and make a bet, like other casino sites. 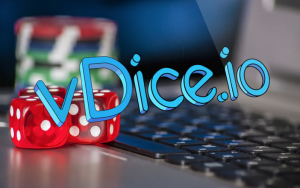 vDice.io has no account system, no deposit and withdraw system so they in other words when you send Ether from your own wallet to one of the vDice Contract Address site will automaticllay calculate the bet result and send you your winning within seconds. They also has a Troll box where you can ask any help from the player, and also there is admin, you can ask anything from him. But recommended method is there Email or support button. They also has a support button, which you can find on the right in the Middle, click the button fill the form they will answer you in less than 24 hours. No deposits. No accounts. Users bet from there own wallets. No withdrawals. It is betting on the blockchain.